It has been a while since I lasted posted on the forums. Recently I have been thinking about making a Lets Play of Machines. In the future I'll be linking to the playlist on YouTube and my YouTube channel, but until I do there is no point in me linking to my YouTube. I have unfortunately run into a few problems while attempting to record Machines itself. I am running a Windows 7 machine and the recording software I am using is Open Broadcasting Software (commonly referred to as OBS). 1: Using Game Capture I am unable to record the visual stuff with Machines. I can use Display Capture instead, but that results in significant framerate drops, as well as the Game's UI frequently and consistently disappearing in the playback. 2: I am unable to record the audio from Machines entirely. There are no audio filters of any kind. If anyone can suggest a way to get around the problems, I would greatly appreciate it. Thanks for the pointer in that last link! Now I need to just figure out what the OBS forum means by "use a Game Capture on the DWM process". With luck, this will result in me being able to do the intended Lets Play of Machines. When I do start uploading the series, I might get the first post changed into an archive for links to the episodes. Something I need to know before I get to making the first episode: is it a bug that the soundtrack doesn't play in the game? I was planning on mentioning that in the first episode if it is a bug, but otherwise I am planning on having the soundtrack play in the background depending on what was happening in-game. Any information would be greatly appreciated! is it a bug that the soundtrack doesn't play in the game? If you try to use an ISO image of the CD (either in a virtual drive or to write to a physical CD), the soundtrack probably won't work - the soundtrack is stored as separate audio tracks on the CD, which the ISO format doesn't handle. I've tried a few different combinations of CD image formats (CUE/BIN, MDS/MDF, MDX) and virtual drive software (Daemon Tools Lite, PowerISO, WinCDEmu), and haven't had any luck getting the game to play music from a virtual CD. EDIT: After some more testing I got CUE/BIN format working with Daemon Tools Lite (other programs and formats might work too) - to get Machines to play the music from a virtual CD, make sure the virtual disc drive has a drive letter before any existing physical disc drives. Here you would need to set the virtual drive letter to either A: or B: - some virtual drive software doesn't allow you to set this, but you can use Windows Disk Management to change the drive letter externally. I haven't tried writing an image to a CD yet to see if the music will play from that yet. you could always play the soundtrack in a media player in the background. ? The music doesn't exactly change for any reason except to stop for clips? Well, before I can even start making the let's play, I'll need to work on figuring out the DWM recording. I can always mention the information to do with the OST not playing and edit it into the background. So here's what I learnt about the DWM: It stands for Desktop Windows Manager, and the process is called dwm.exe. And here's the problem: OBS, in my version anyway, cannot target a non-application process. I will try updating to see if it can all of a sudden, or maybe try editing the config file for the Game Capture. @Mordakai95 search "VB-audio Virtual Cable" and tell me if that helps. @Mordakai95 I always use OBS to record anything, but I remember fraps working best with Machines many years ago on WinXP. The music regulator in the audio console (options menu) goes back to 0/none as soon as I get out of said menu, whether from the main menu or in-game. Is machines.exe set to run in a compatibility mode? 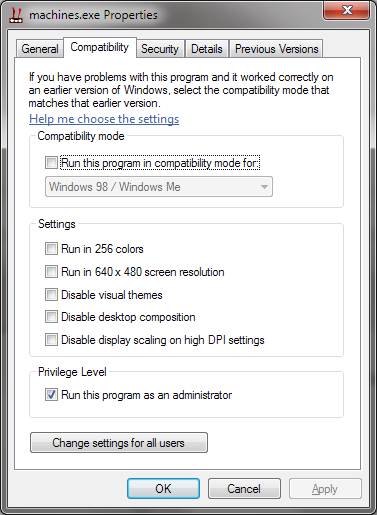 If so, try unchecking that option (right-click on machines.exe → "Properties" → "Compatibility" tab). So far this is the only thing I've found that causes the music volume slider to reset to 0 - at least on Windows 7. Running as an administrator could help, in case a user permission is preventing the game from reading/writing settings to the registry.